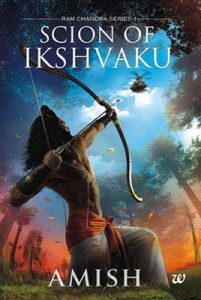 For those of you who have read the Shiva Trilogy, Scion of Ikshvaku can be labeled as a prequel to them. There is hardly anyone who isn’t familiar with Ramayana. There have been several TV series directly or indirectly based upon the same epic storyline, and as a book too this isn’t the first effort (of course the Valmiki’s Ramayana and Tulsidas’ Ramcharit manasa were the original ones). However, the difference in Amish Tripathi’s book(s) has been his different interpretation and explanation of the supernatural stuff prevalent in the pre-existing texts into a regular world. The story of ‘Scion of Ikshvaku’ begins from the day Ram was born to the day Sita was abducted by Raavan. According to Amish, Ram’s father, Dashratha is shown to face a great defeat at the hands of Raavan on the day of Ram’s birth. Since that day Ram is considered inauspicious and people ignore him or look down at him including his own father. Ram grows up facing a tainted childhood, where his only comfort is his half-brothers who stand by him in every situation. It is almost by the middle of second half of the book when Sita makes appearance just prior to a dramatic Mahabharata-inspired swayamvar. I don’t really have to expand on the storyline as the basic of remains same as the one we’ve grown up with, only difference being the philosophy and explanation of individual events. Let’s take a deeper dive into the good and bad of the book. The language and writing style has improved from the previous books and it stands at par with any other author of fantasy books. Since there wasn’t much scope of altering the storyline from the standard Ramayana, Amish has made up for that by adding philosophies to explain many issues and twisting the events in a manner that they were explainable on regular human grounds. Characterization has been brilliant, each character receiving their own space and traits. Connecting and expanding the events and philosophies depicted in the Shiva trilogy. I think there was still quite scope for playing with the storyline. Some things could have been done in a better way. For example, Ram is mentioned to be ‘A tortured and ostracised prince. A prince they tried to break’ who had faced a difficult childhood. But I think author could have worked a little on that front, because beside the mention, there isn’t really anything shown to prove that. The comfortable Gurukul part overshadows everything. I can’t really understand why author wanted to incorporate a few events in a manner he did, for example, the twisting of swayamvar scene inspired from Mahabharata’s Draupadi swayamvar, or Tadaka’s scene as being imbecile asuras. Well, I don’t think I want to say anything about the Roshni/Nirbhaya scene. Then Dwarka’s incorporation as a historical event during the period of Ramayana, while historically Dwarka was founded by Krishna in a different era much later after the events of Ramayana. That’s just unnecessarily fiddling with the history in my opinion. The opening scene which was also the climax scene could have been written a little better. It seemed something was missing from it. No mention of Mareech? Khar and Dushan? It was mentioned that the deer was different from the rest of the herd, but how and why? Having said all that I found the book really a good read, and I’ll be waiting for the second volume in the series eagerly. The plot is, no doubt, one of the most recited plots in India. Picking up such a famous storyline which almost everyone in India remembers by heart and realizing it into a great novel was tremendous task. With little ups and down Amish Tripathi has done a great job. Characterization is good. Language and writing style is great. What else can I say? Overall 4 points to the book. With little ups and down Amish Tripathi has done a great job. Characterization is good. Language and writing style is great. What else can I say? Overall 4 points to the book.